A spokesperson for President Rodrigo Duterte said the closure would begin on 26 April. Earlier this year Mr Duterte said Boracay was turning into a "cesspool" and threatened to shut it down. The island, known for its white-sand beaches, attracted nearly 2 million visitors last year. 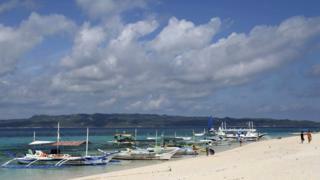 The decision has prompted concern for the thousands of people employed in Boracay's busy tourist trade. The island is home to around 500 tourism-related businesses, which drew in annual revenue of $1.07bn (£760m) last year. The government said affected companies will receive financial aid. It's not clear how the shutdown will be implemented, though the department of trade and industry had earlier proposed closing the island down in phases, saying a total shutdown would be detrimental to businesses and livelihoods. The move follows growing concern over the island's environmental health. Officials had warned businesses had been releasing wastewater into the surrounding waters. In February, Mr Duterte condemned the island's hotels, restaurants and other tourist businesses, accusing them of dumping sewage directly into the sea. "I will charge you for serious neglect of duty [for] making Boracay a fishpond or a sewer pool," Mr Duterte said at the time. "Either [you] clean it up or I will close it permanently. There will be a time that no more foreigners will go there."